Remember these sweets from the mid fifties. They were delicious. Can still smell them and even almost taste them. Didn't realise they were made by Duncan's who also made lovely hazelnut chocolate. I miss these too. There is a peppermint flavoured one from Merrols and I hoped that one day I would see the butterscotch back in the shops but sadly not. 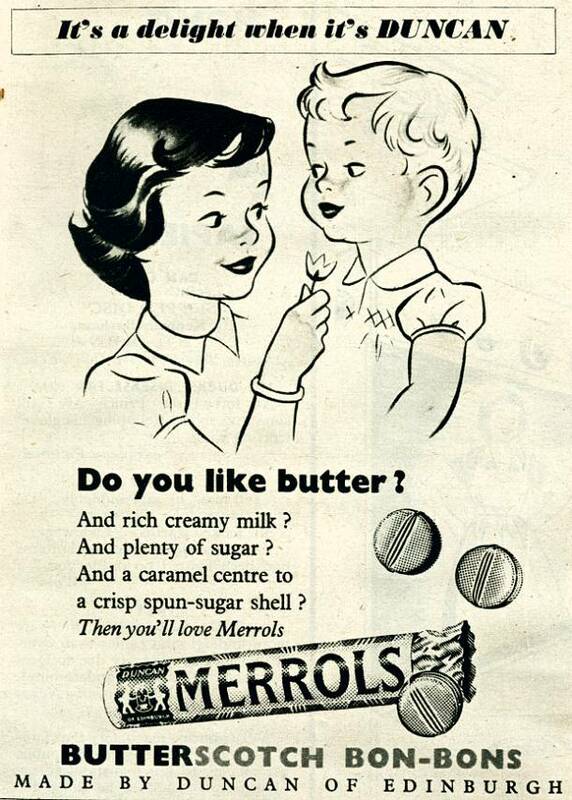 I adored Merrols as a little girl and was so sad and surprised when they disappeared! Today have discovered all about them and can still taste them - and still miss the taste of them! I've been looking online for years for a mention of these boiled sweets, they were delicious. I suppose the nearest equivalent would be something like a soft-centred Werther's Original. Thank you, you've made an old lady very happy today !